The world is dark and dreary, now that I'm alone. For life is not worth living, since your love has flown. Gone is all by sunshine, all joy fled away. 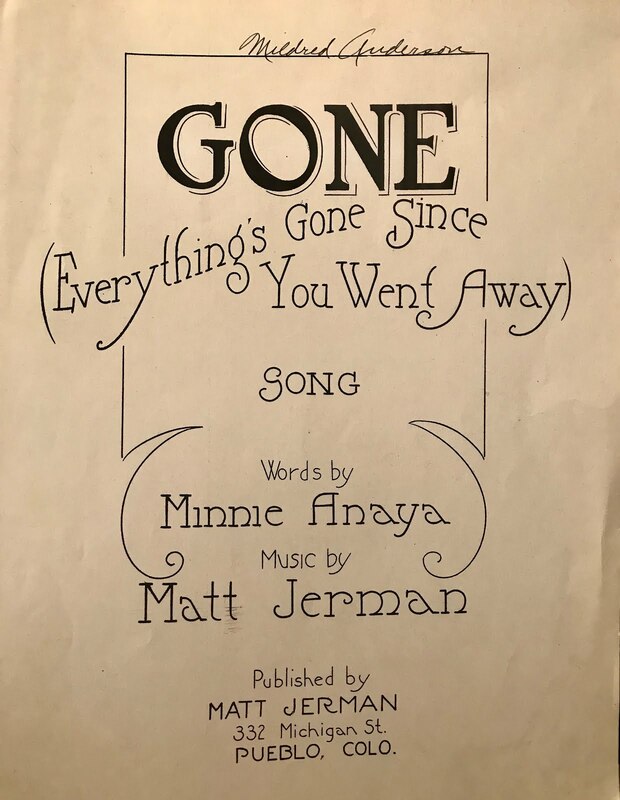 Gone is all that made my life seem bright, that's why I say. 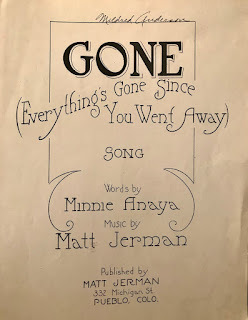 Gone, gone, everything's gone - even your love once true. Gone, gone, just like a song after we learn a new. Gone just like the snow, after a brief sunny day. Gone everything's gone, since you went away. My heart is sad and lonely, my soul is aching too. You were not worth the loving. Gone is all my gladness. All my hope fled away. Just a golden memory, is all I have today. According to the History of Colorado Illustrated Volume II (1918) - Matt Jerman was born in Carniola, Austria, Feb. 6, 1880, the son of Jacob and Katherine (Grahek) Jerman. He was eight years of age when he was brought to America. He attended schools in Pueblo, and later did brick and steel work. In 1902, Jerman married Catherine Hoffer, of Pueblo. They had five children - Dorothy, May Margaret, Bernard, Frances and Albert. He was the national vice president of the Grand Carniolian Catholic Union of America, with offices in Pueblo. Jerman was also a politician, who served as Pueblo alderman, at one time. 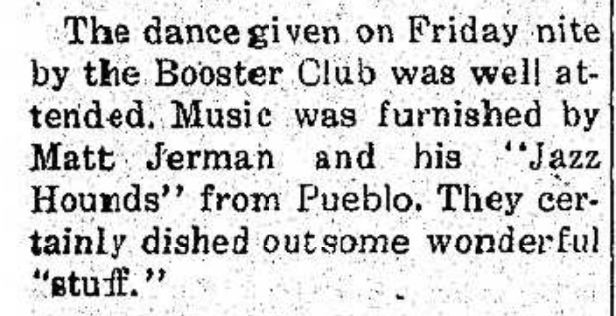 A 1945 story, in the Denver Catholic Register, indicates that Jerman was a professor, but the story didn't indicate where. 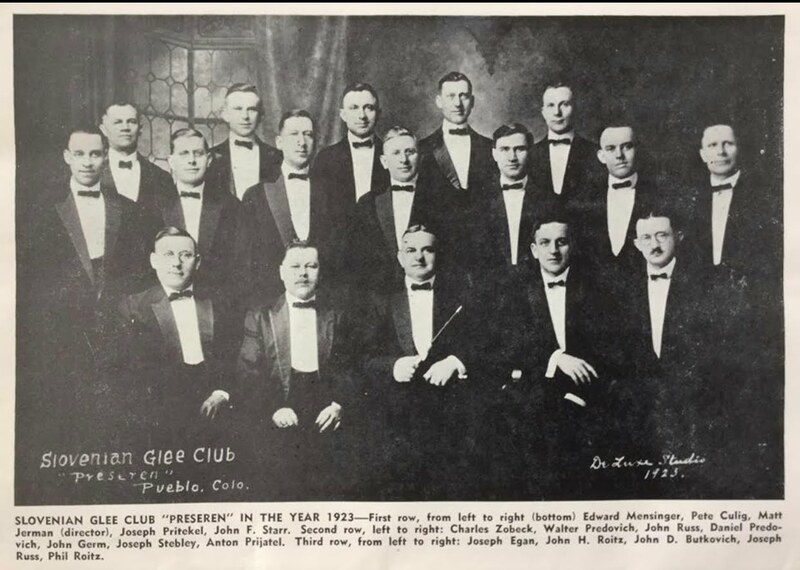 The story also noted that he was involved with the Presiren Club, a local Pueblo glee club. A rare novelty, but more so because of the admirable contents of the songs and the artistic, melodies. Miss Dorothy Jerman, daughter of the director, was the accompanist for both pro­grams. 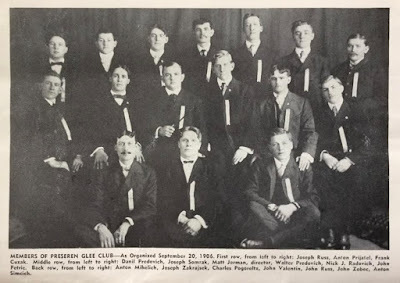 The glee club took its name after the foremost bard of Croatia, a notable poet and thorough musical composer, one of many who have stamped the music and literature of Slo­venia with the national character­. Matt Jerman second row, third from the left. 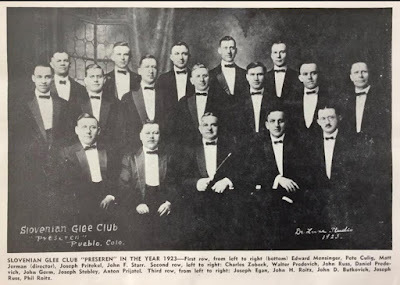 Besides being in the Slovenian Glee Club, around the same time the sheet music was published, Jerman was also the leader of the Pueblo 1920s-era band, The Jazz Hounds. 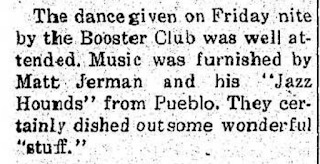 Jerman apparently spent quite a bit of time in Haswell, located 90 miles east of Pueblo, as I found a few notices of concerts in the small town - between 1921-1924.